If you've hiked to the Flame, please rate it below. 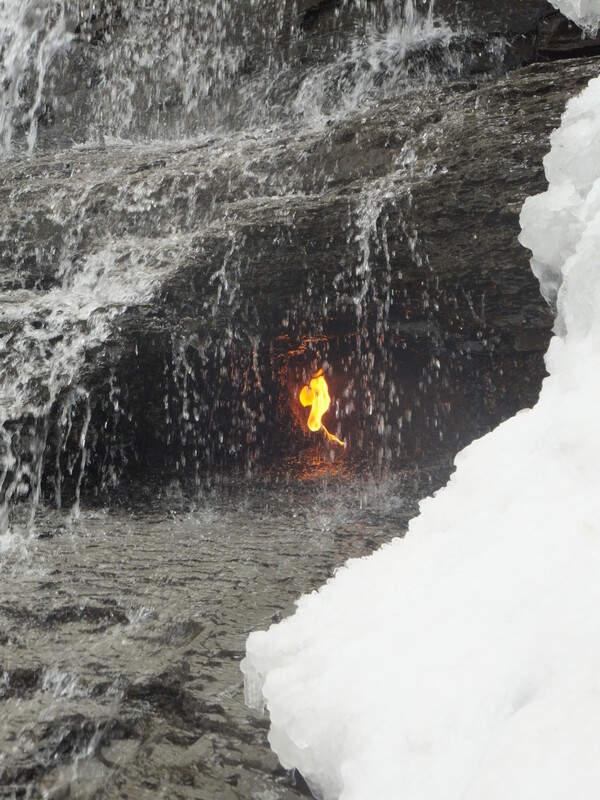 Hike one of the trails to the Eternal Flame Falls and you'll find a dancing natural flame behind a cascade of water. Admit it, the only thing that can make a waterfall cooler, is having fire behind it. Even better, though there are several hundred wild flames, this is the only known natural occurrence combining falling water and fire in the world. With most round-trip hikes to the falls lasting under two miles, this amazing phenomenon is accessible to many people. This spectacle is located in Chestnut Ridge Park, just about six miles from Ralph Wilson Stadium where the Buffalo Bills dazzle Western New Yorkers with their skills in football greatness. The map and trail descriptions in this article, detail the journey from both the Corral and Seufert Road trailheads. 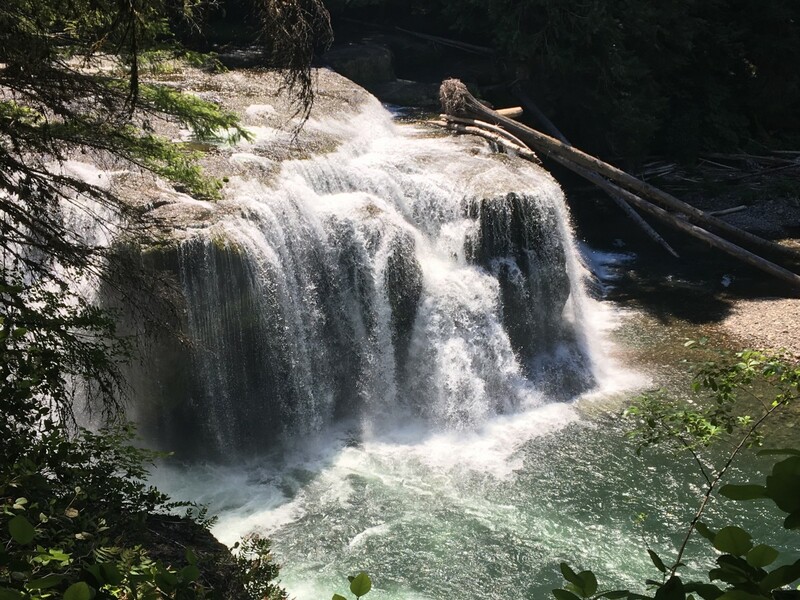 So whether you are looking for a family friendly hike in the Buffalo area or to be inspired by a natural wonder, the walk to the Eternal Flame Falls never disappoints. 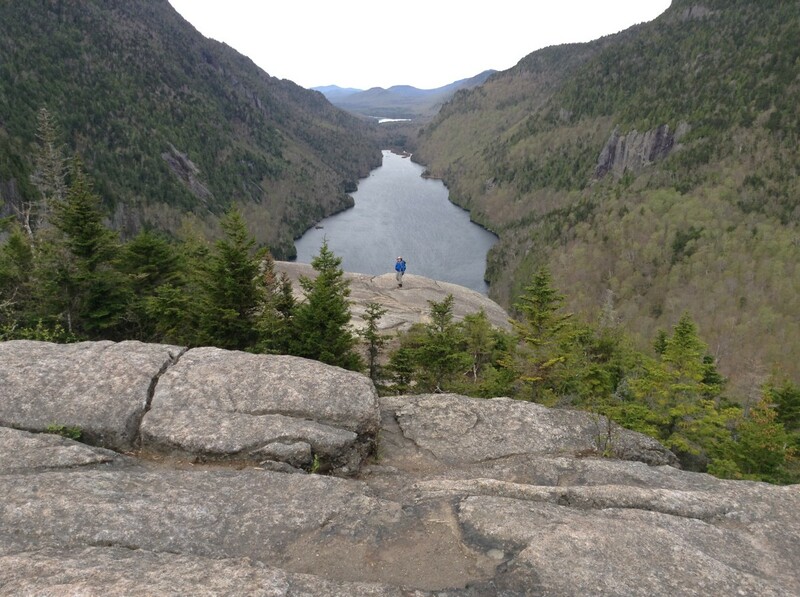 I have been well acquainted with the Flame, having hiked to see its beauty dozens of times in various conditions. As you can see from my photos and videos I've taken over the years, the flame is timeless, even throughout its seasonal cycles. Though I am inclined to think that there is a dragon sleeping in a hidden shale cave, the flame is the result of some sort of natural gas fissure. At some point in history, some brave adventurer had the foresight and the courage to light the gas and create the spectacle. Many surmise that Native Americans were the first to discover the Flame and I can only imagine what religious and practical significance it had for them. Recently, researchers from Indiana University have studied the Eternal Flame to find out the exact cause of its existence. Their findings were published in the May 2013 issue of Marine and Petroleum Geology and have caused renewed interest in the Flame. 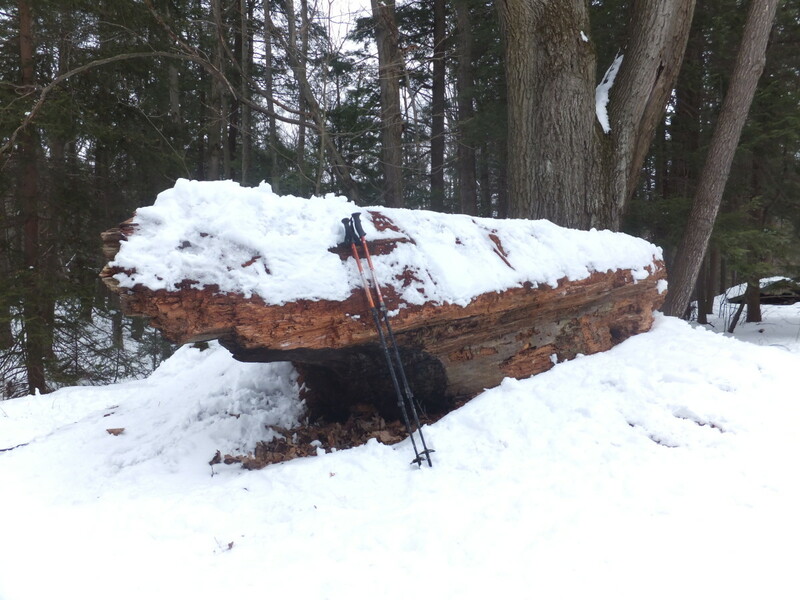 Opposed to other eternal flames, the shale of this Chestnut Ridge feature wasn't as warm or as old as expected. Therefore, these geologists surmised that the process here in New York is a new form of gas production that requires additional study. Occasionally, especially in the Spring, the fire has been flooded out and extinguished. It is quite alright to relight the Flame as no terrible Darth Vaderish burning incidents have been reported. This part of Chestnut Ridge Park is an especially fragile and unique eco-system, please treat it with respect. 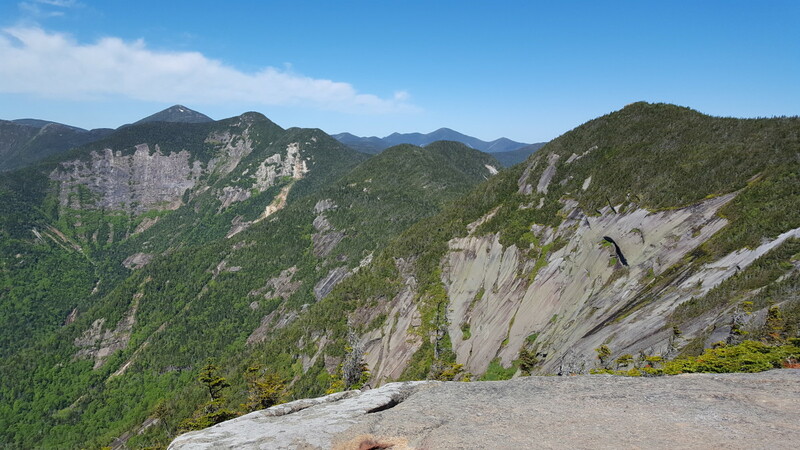 While hiking here, practice Leave No Trace backcountry ethics by "Taking only pictures and leaving only footprints." That said, please be careful where you leave your footprints. Stay off of ravine walls and do not climb on the shale. Pack out all trash with you. If you hike with a pet, make sure it is leashed and clean up after it. Do not collect wildflowers, rocks, artifacts while in the park. Leave them there for others to enjoy. Let's make sure that future generations of adventurers can enjoy the Flame, by treading lightly and preserving this area. This trail has been the site of several recent accidents and even the death of one teenager slipping into the ravine. As with all outdoor adventures, take care as you are responsible for your own safety. 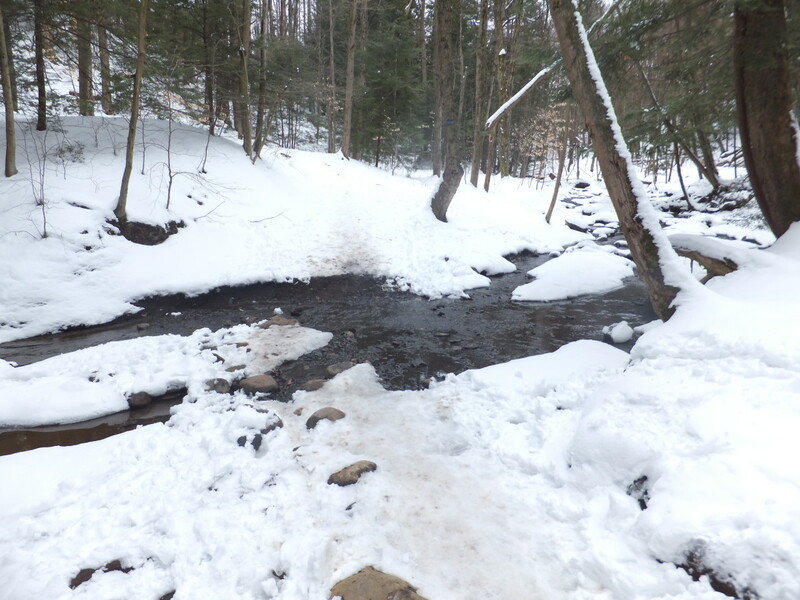 The trail to the Eternal Flame can be rather slippery in places, especially once you descend into the Gorge and begin walking in the creek bed. Closed toe shoes are a must for hiking and many folks change into water shoes or a hybrid sandal like a Keen Newport for walking in the water. Do not walk barefoot or in flip flops. Wear proper footwear like hiking boots. File a trip plan with someone back home so they know where you are going and when you'll be back. Consider carrying a hiking stick or trekking poles to steady yourself. Avoid venturing near the edge of the ravine - many are fragile undercut shale. Do not climb ravine walls. Avoid hiking when the trails are slippery and muddy. Don't rely on technology, but carry a fully charged cell phone. 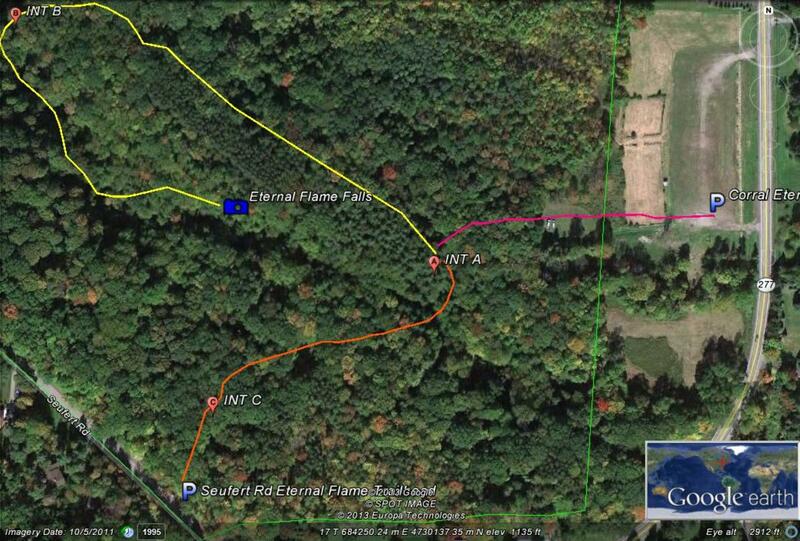 I created the above map using Google Earth and the track log from my GPS. I highlighted the different sections of the trail in colors; however, be aware that the actual trail markings do not reflect these colors. 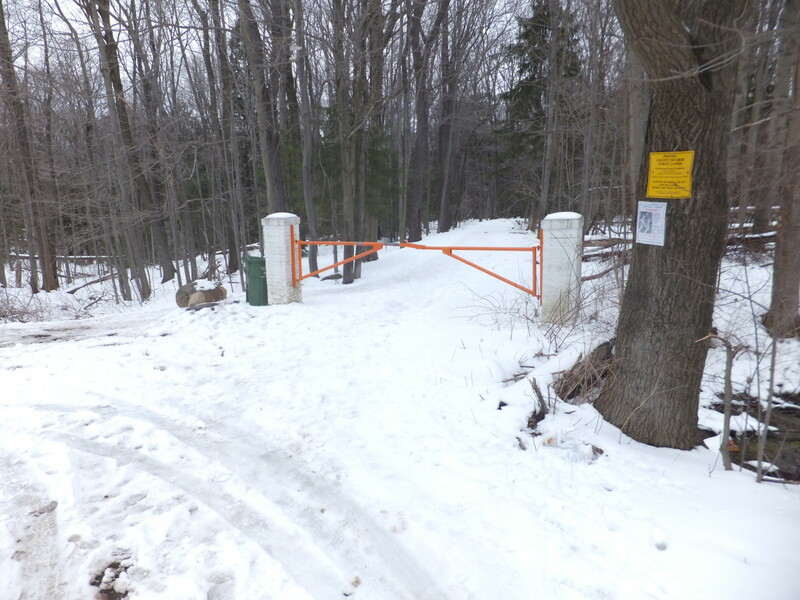 Most of the actual markings of the trails in Chestnut Ridge differ greatly, due to a motley group of trail maintainers over the years without a unified vision. Likewise, I have labeled a few of the intersections on the map to make it easier to follow; these junctions are not labeled within the park. Of the two trailheads, this one has the best parking and the clearest markings to walk down to the Flame. At one point, the parking lot was a horse corral. You'll hear many locals say, "meet me at the pony corral" even though there hasn't been a pony here in years. From the parking lot, head into the woods down the trail. 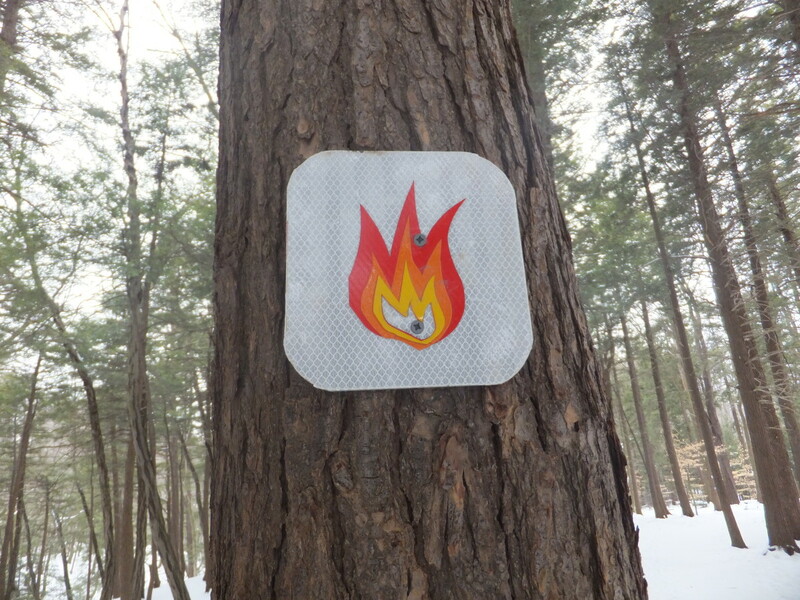 Look for trail markers depicting a small flame on the trees; you will follow these down to the ravine. Pass through a grove of hemlock trees. Arrive at Intersection A after walking .17 miles. Walking left will take you to the Seufert Road trailhead, walking right will take you to the waterfall. At one point, the Seufert Road trailhead was the entrance to the Shale Creek Preserve. There is roadside parking for several cars. On this trail, you will want to follow the blue block trail markers, which are standard until you reach Intersection A. Begin walking on a jeep-trail past the gate by following the blue blocks. At .04 miles you will reach Intersection C with an unmarked trail. Following this unmarked trail allows you to see the waterfall from above; however, it does not give you access to the lower gorge. The trail opens up to a large area at .10 miles with a concrete slab from an old pavilion, a kiosk (which in May was in disrepair) and a large log. Take a look at this log, it is the trunk from a California Redwood tree. It was brought here when the Buffalo Museum of Science controlled access to this property. After this clearing, take the trail into the woods. At .17 miles, cross a small creek on rocks. There is no bridge here and in spring you may end up with a wet boot. After the crossing, trudge up a small hill. You will reach Intersection A after walking .23 miles. 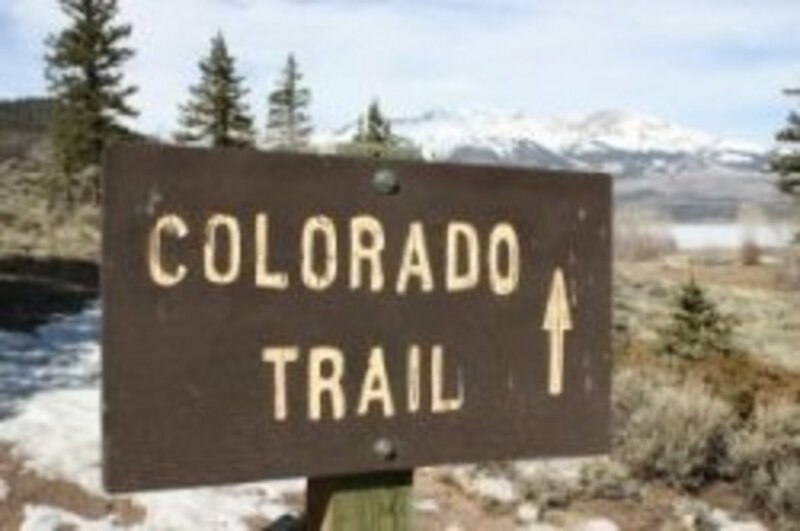 If you go right, you will reach the Corral Trailhead. Whether you decided to walk from Chestnut Ridge Road or Seufert Road, you should end up at Intersection A. From here, you will take the trail down into the ravine and end up at the Eternal Flame Falls. 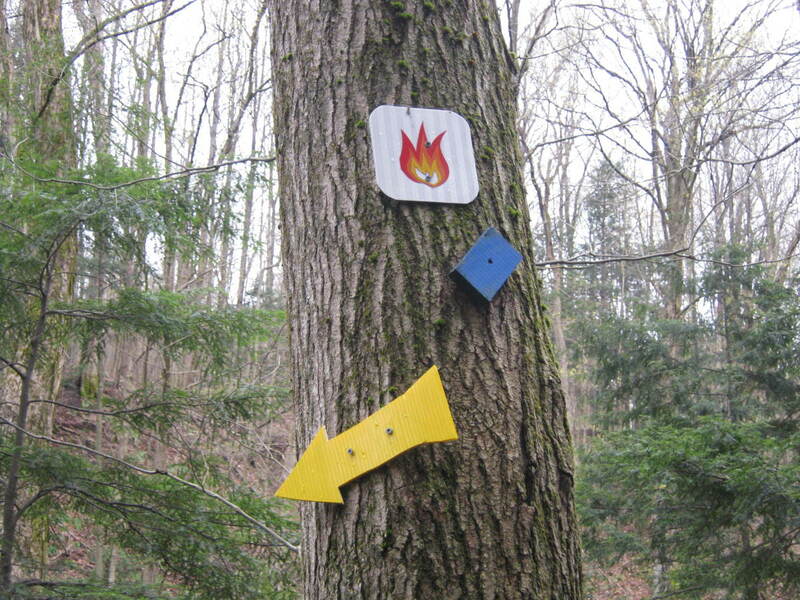 The path is marked with both metal flame placards and blue block trail markers. As the most common approach to the falls is via the corral, all mileage is based on a trek from that trailhead. From the intersection, head North on the trail on the ridge above the creek. Soon, you'll hear the waterfall below with occasional glimpses into the ravine on your left. Be careful if you wander to the edge - it is a 150 foot drop in some places. At .34 miles from the Corral TH, begin to descend gradually into the gorge. Near the creek, reach Intersection C at .43 miles with the Red Trail. This 2.73 mile trail makes an interesting alternate approach to the area. 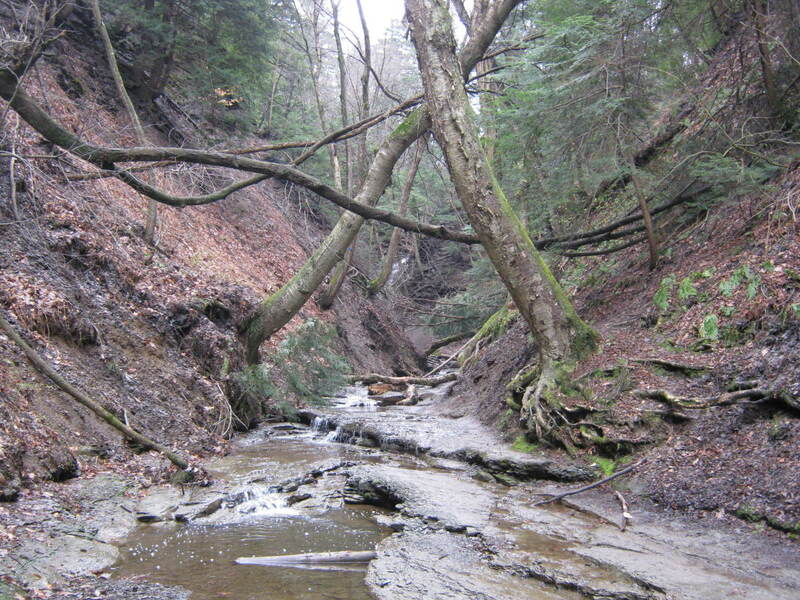 Turn left on the trail and follow the stream bed up Shale Creek Gorge. 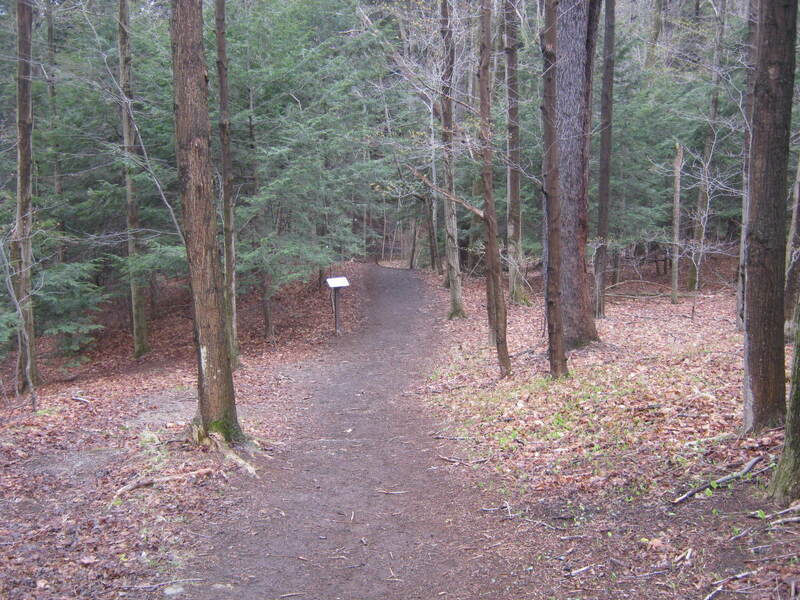 At this point, the trail winds to the left, right, and in Shale Creek. Use your best judgement when picking a path and be careful of the slippery rocks. There are several small waterfalls in this passage, there is a particularly pretty one at .64 miles. 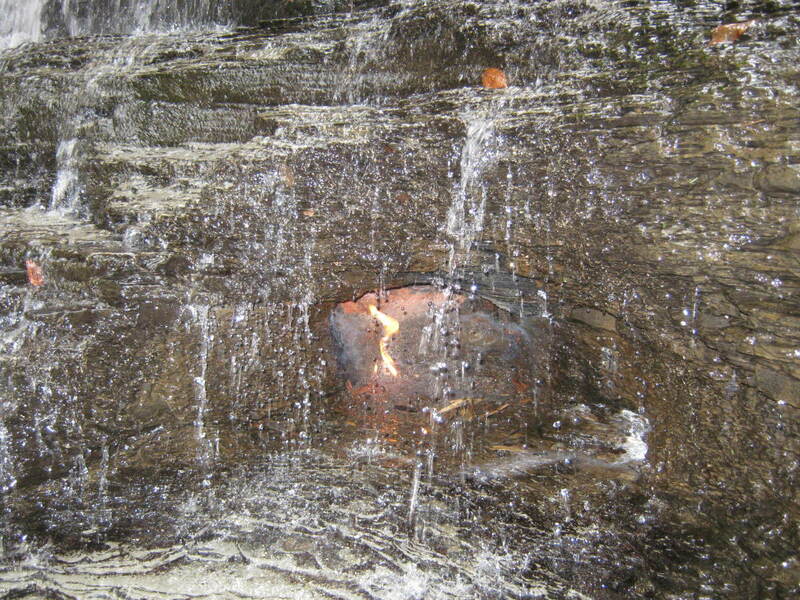 At .75 miles from the trailhead, you reach the base of the Eternal Flame Falls. To return to your vehicle, simply retrace your steps. When the area around the waterfall is busy, allow others to have their time with the cascade by giving them space. It is hard to marvel at the beauty of the natural world, when someone is pushing you out of the way to take a picture. Do like your kindergarten teach taught you and take turns. Eternal Flame Falls is a thirty-foot cascade on Shale Creek, which is a tributary of Eighteen Mile Creek. The grotto that contains the flame is located to the right of the waterfall as you are looking at it. Though some guides advocate climbing up the cliff using root handholds, this is dangerous to you and destructive to the environment. 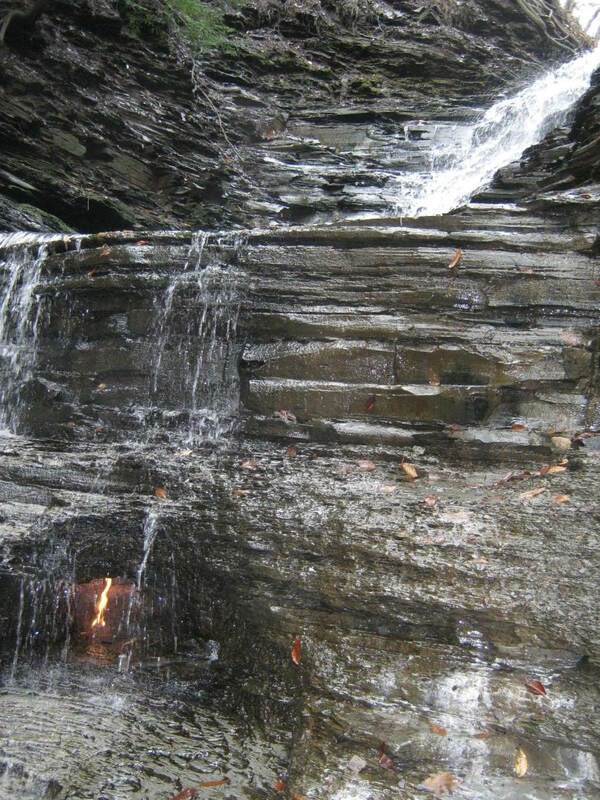 Besides the two trails listed, there are other ways to reach the Eternal Flame Falls. Someday perhaps, I'll pen the trail descriptions for these. For now, consider this a way to explore the park and make your own discoveries. The one approach I don't suggest is bushwhacking and scaling down the cliffs into the Gorge via one of the gullies. Not only is this dangerous to you, but dangerous to the fragile eco-system. Thought trekking to the Flame at night is popular, the slippery terrain can be perilous after the sun sets. Further, Chestnut Ridge Park officially closes after dusk, so you are hiking "out of bounds" so to speak. As always, be careful and follow regulations. Have you hiked to the Eternal Flame Falls? 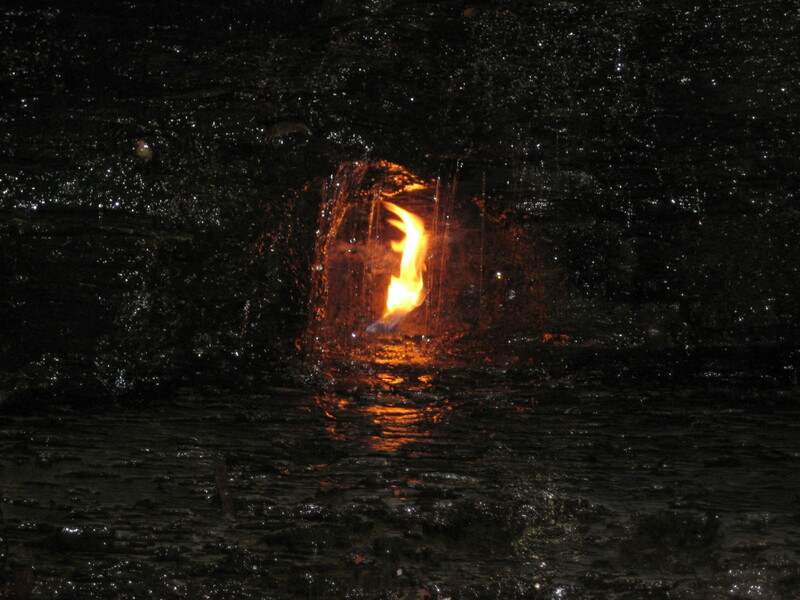 If you've had the opportunity to hike to the Eternal Flame at Chestnut Ridge Park or have seen another one around the world, let us know about your experience. If you have any questions about this hike, let me know. I'd rather have informed people hiking in the woods than a bunch of yahoos wandering off trail and destroying this unique area. How long does a one way hike to the Flame take? A brilliant hub and I now look forward to many more by you. So much beauty in the world. Had no idea this existed. Thanks for the great hub, interesting and definitely a must see for everyone. Thanks for the comment Sophie. I totally agree that Chestnut Ridge Park has multitudes of hikes for hikers of all abilities and interests. The possibilities seem endless and I've yet to become bored of walking through the woods there. I've done most of the geocaches there for practice with the SAR team and it is a great way to find yourself sauntering through the park. I live in a town just outside of buffalo and really enjoy this hike. You can hike the whole trail or turn around at the falls and hike in one of the many other beautiful trails in chestnut ridge park. The whole park is beautiful and there are several geo caches. This hike is great for dogs (that are willing to walk in the water) and little kids. There are also several great restaurants nearby. All in all this is a really great hike. I do see many people bring their dogs on their hike to the Falls. It is fine as long as they are leashed and you observe the common dog-owner courtesies. If you go during the summer, the water that you need to wade through is only about 6-inches deep. I hope you get to hike it Suhail! This looks like a great hike that I will certainly undertake soon. It is also close to my home. I am not sure if I should bring K2 (the dog) along. Thanks again CC for sharing, I really appreciate it! Thanks as well KrisL! It is quite amazing and people don't believe me when I tell them about it. One I took a friend down there promising them "something" really cool. 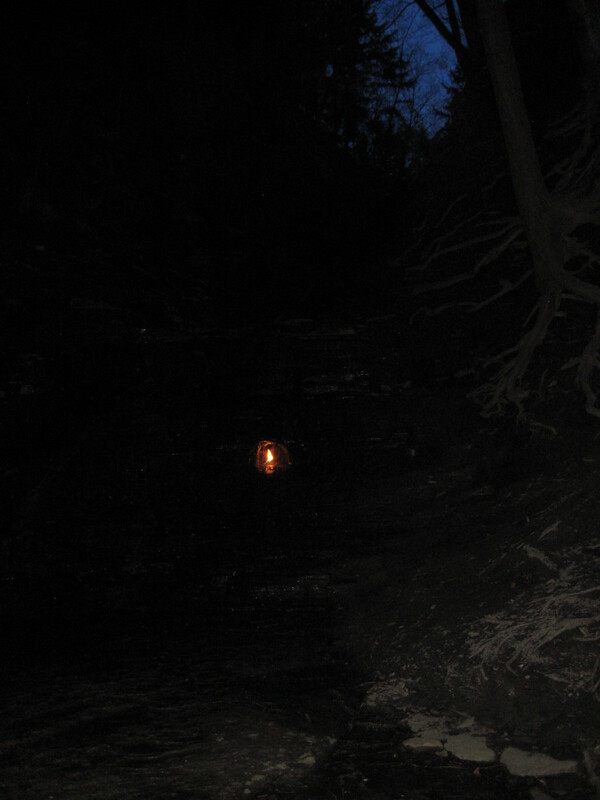 Their mind was blown when we turned the corner and saw the flame flickering behind the falls. If you ever visit Niagara Falls make a short side trip to Orchard Park. Wow -- if I had run into this in a fantasy novel it would have strained my belief. If I'm ever in that part of the world, I'll visit for sure. I sadly haven't been on HP too much lately either as I've found a bunch of other things that need doing. Pictimilitude is pretty awesome though with great pictures! The EFF is entirely awesome though, great to hear from you CC. I've watched people photograph just the shale formations for hours along this trail; the easily fractured rock is really cool and morphs over the years as it crumbles. Thanks for the votes, shares and comment chef-de-jour! I'm glad you enjoyed it. Thanks for the comment howlermunkey. Being an "avid hiker" is in the mind. 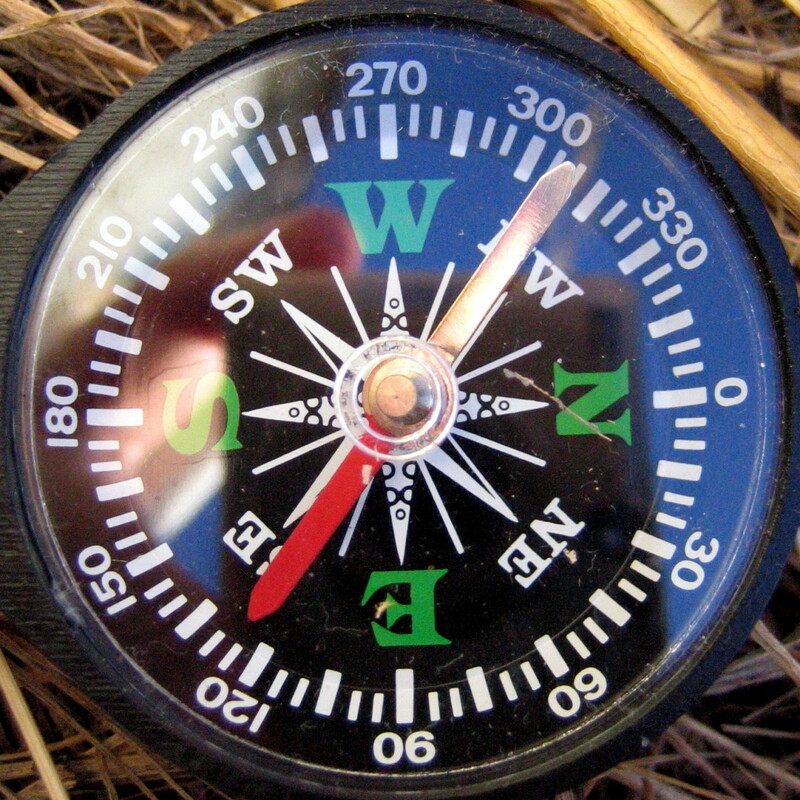 If you see yourself as an avid hiker, you are one - no mileage standard required. Though I've hiked to the EFF dozens of times, each time I am rewarded by how unique it is. See ya on the trail! Well Sharke11, I am pretty sure you qualify as a hiker and wouldn't have any problems tackling the EFF trail. Sadly, I have to give out the warning not to disturb the landscape, as sometimes people lack any sort of sense at all. I guess that is a symptom of humanity, we quench our desires in the present and neglect our needs in the future. Oh, if you ever do make it up this way - check out Niagara Falls too - just stay out of the touristy areas. That is pretty cool! I would much rather see that than Niagara. I love fire and water. Seeing them together would be perfect! I won't lie and say that I am recreational hiker, but I did used to live in an area so remote that we had to walk two and a half miles to check our mail. Down steep, craggy hills, across a creek, over a cattleguard, up a dirt road, around a marsh...so this sounds like a pretty easy trek. (I won't even mention what we had to do to walk to the back of our 190 acres. It was probably not smart...) I love that you put in the advice for people to not tear up the natural landscape. I hate when people do that. Just because nature is enduring, doesn't mean that it can't be unpleasantly rearranged if people go yanking roots and causing avalanches! If I ever make it up that way, I will definitely check out this place. Great hub, beautiful photos! My jaw dropped when I read the title of this hub, I am an avid hiker (.... 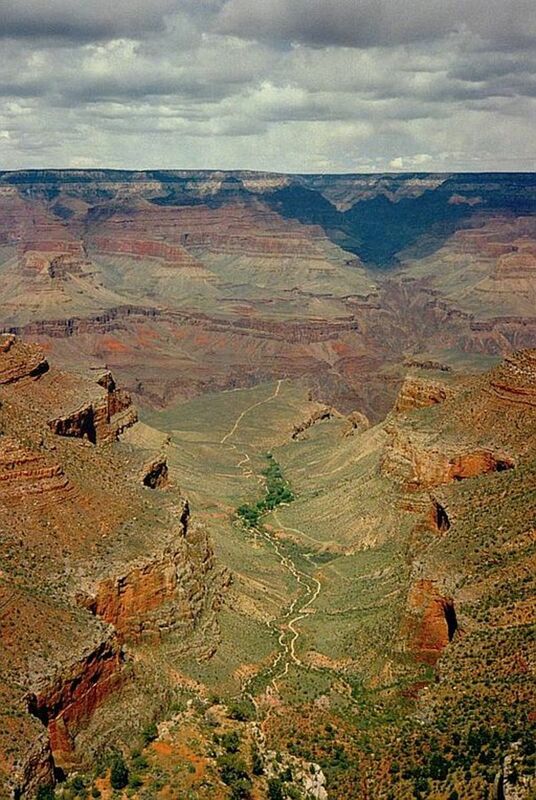 Okay, well, wanna-be avid hiker), and that has to be the craziest destination I've seen yet. You're right, falling water AND fire... and you're right, if the Native Americans knew about this I can't even imagine how sacred this spot must have been. I need to go hike this asap! (PS -- Proof that Dragons do exist). 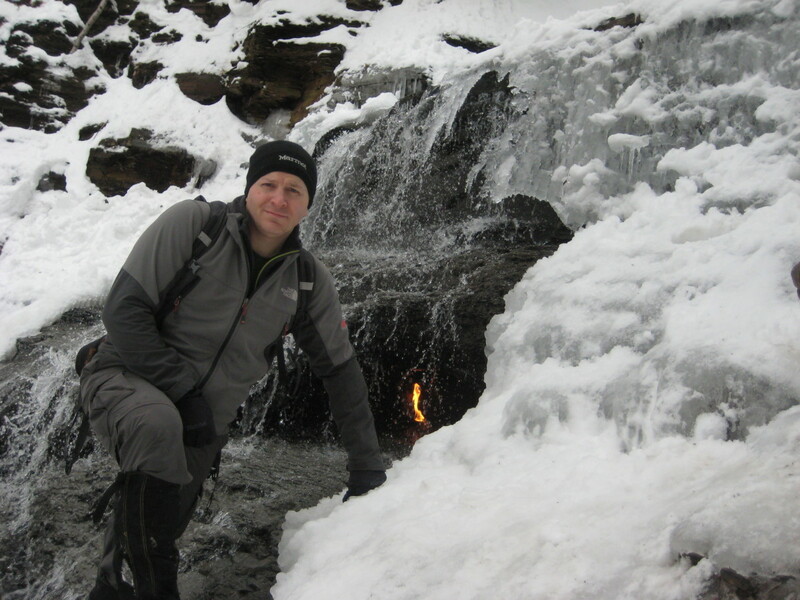 I really enjoyed this hike - both ways - to the Eternal Flame. Great to see your pictures and the descriptions fit nicely. 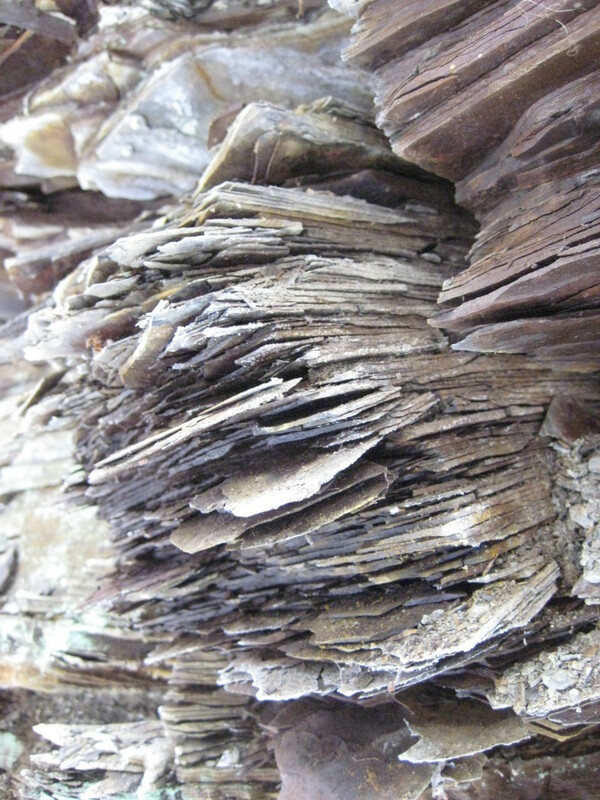 Such curious shale formations too. Lots of info for us and good tips. This place looks entirely awesome. Sorry I haven't been around much - if you've done a lot of publishing - I am addicted to my blog and website these days...still love HP, but dividing my time between here and there...well...I suppose my website wins, lol. Hope you're having a great Memorial Day! I found out there is a lot you can learn about pretty much anything on HubPages MsDora. It is what happens when passionate people write about what they love. Faith Reaper, I appreciate the compliment. I really wish my photos and videos could do the beauty of this special place some justice. Like I said, this is worth the trip for anyone in the area. Thanks for the votes and shares! Dan, the Eternal Flame is one more thing I learn about on HP. Prospective hikers have lots of good advice here, thank to you. 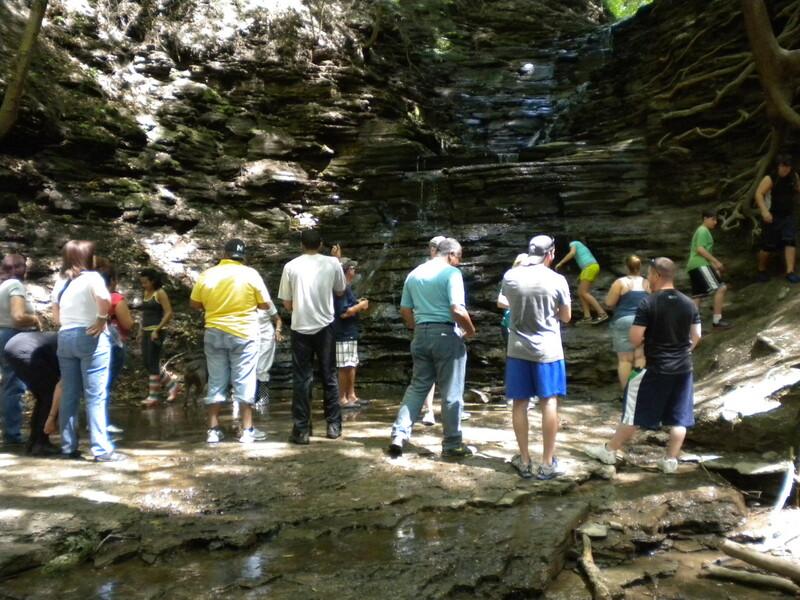 Thanks so much for taking us along on your hiking trail to the Eternal Flame Falls. Very fascinating indeed! Your photos are stunningly beautiful. Enjoyed the read. Everyone comes to Buffalo-Niagara to see Niagara Falls, but few know about this little jewel just a stone's throw away. I know you would enjoy it! By the way, I have never been to the stadium and have no reason to go there either. I'm working on a bunch, as I'm getting back in the swing of things here. Thanks for commenting and maybe I'll see you on the trail bankscottage. What an interesting hike Dan. This is my kind of hike. I get to the Buffalo area once in a while and I am going to have to make some time to see the eternal flame (but I see no reason to visit the stadium). Hope you have more hiking Hubs coming in the future. I always look forward to them.